Fanatic Cook: Are Ape Diets Suited To Humans? Are Ape Diets Suited To Humans? As a follow-up to my post about the BBC's experiment in which they fed "the sort of diet our ape-like ancestors once ate" to a group of 9 volunteers (who in 12 days experienced impressive reductions in weight, cholesterol, and blood pressure), here's a glimpse into some anatomical differences between humans and apes. Our closest living relative in the animal kingdom, the chimpanzee (a great ape), and our next closest relative, the gorilla (also a great ape), have much smaller small intestines, and much larger large intestines (colons) than we do. 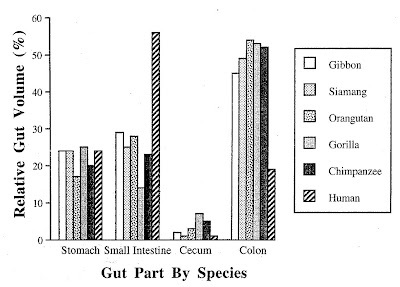 "In humans, more than half (>56%) of total gut volume is found in the small intestine, whereas all apes have by far the greatest total gut volume (>45%) in the colon." "In addition, the size of the total human GI tract in relation to body size is small in comparison to those of apes." - Katharine Milton, Nutritional Characteristics of Wild Primate Foods: Do The Diets Of Our Closest Living Relatives Have Lessons For Us? The small intestine is the place where most chemical digestion and absorption take place. The large intestine is the place where undigested material is fed upon by bacteria, and where water is absorbed prior to feces exit. "The proportions of the modern human gut appear to reflect the fact that many foods are "predigested" by technology in one way or another before they even enter the human digestive tract." ________Chart from Milton's Nutritional Characteristics of Wild Primate Foods: Do The Diets Of Our Closest Living Relatives Have Lessons For Us? OK then the big question is when did the change in physiology take place and why? Was this recent in, say, the last 10,000 years or was it evident in pre-humans like Homo Erectus or later in Neanderthals? Is there any fossil evidence that would show relative sizes of intestines? Are any stool fossils available for study. (Now there’s a career path, stool fossil expert. Can you get a PHD in Poopology?). Is it driven by diet, by cooked food? Cecum is for digesting cellulose if I'm not mistaken. What I'm taking away from this graph is that apes are more apt at digesting plant material and humans animal material. Am I wrong? Maybe I'm jumping the gun, but are you looking to see how "predigested" might fit with cooked food? I'm interested to read the book you mentioned on cooking making us human. If you do happen to read it soon, let us know if you think it's worth the time. Great thoughts. I'm trying not to jump to conclusions and just go with the evidence. What I'm reading is fascinating. So, ElDoubleVee's comment about age, when did the change in intestinal sizes take place? It seems it took place a long time ago, much longer than 10,000 years. According to Milton, "it is difficult to state when the change in gut proportions between humans and apes originated," but it was very likely present in Homo sapiens 160,000 years ago, and likely evolving during Homo erectus (up to ~1.8 mya) and possibly even Homo habilis (up to ~2.4 mya). In concert with the changes in gut proportions was growth in the size of the brain. The brain has huge demands for glucose - of which plant foods are a good source. Both of these changes, gut and brain, as well as changes to other bits of anatomy, occurred because of 2 things ... environmental pressures and how our species dealt with those pressures. I hope to post more later. Manu, yes, the cecum is one place where cellulose is digested, however, humans don't digest cellulose, microorganisms do. From what I read, apes digest animal foods with no problem, as do humans, up to a point. In fact, "many primates [including monkeys and apes] appear to relish [animal foods]." Apes' and humans' digestive anatomy is more one of an herbivore than a carnivore, though. shaun, I'll be sure to blog about it. I probably won't be able to help myself. I think the reason the diet was able to change was a modification of teeth. Being able to grab and tear flesh was a requirement to move up the food chain buffet. my question is, can humans survive only on plant base diet as apes or not. I think humans can survive on a plant-based or vegan diet. The point still debated is whether they thrive. If you ate only plants your entire life, you would likely be deficient in vitamin B12, maybe some minerals. Of course, you could take supplements. But then, you could be deficient in nutrients on a Western diet too. So what is the optimal diet? Grain/legume, fruits, veg, nuts seeds? I think humans can survive on a meat-based or total meat diet. The point still debated is whether they thrive. Meat has a sugar called Neu5Gc, science says it is the cause of cancer in many people. Meat eaters have gut bacteria that has an adverse reaction to meat - it causes production of Trimethylamine N-oxide (TMAO), which is a leading cause of heart disease. It does not appear man evolved to eat meat. Some point to the lack of B12 as proof plant based food is somehow flawed, but B12 is not created by plant or meat - it is created by bacteria. This bacteria happens to exist in all animals, and in humans too, but where it is produced in our bodies can not be absorbed (does not pass through gut). Our modern way of living has cleaned off the trace amounts of B12 plants have. But B12 can be naturally made from brewers yeast. Note that as we age, absorbing B12 from meat becomes difficult and everyone age 60 and above should be taking B12 supplements (from a non-animal source).